When ancient alien technology is found on a colony world, when robot soldiers from an eons-old interstellar battle restart their war in a highly populated sector, when a global computer system starts to break down or take over, in goes the Starfleet Corps of Engineers. Overseen by Captain Montgomery Scott from his office at Starfleet Headquarters, the S.C.E. can build, rebuild, program, reprogram, assemble, reassemble, or just figure out everything from alien replicators to to doomsday machines. Just don't expect them to perform miracles -- unless they have to. The U.S.S. Enterpriseè has defeated a gigantic marauding starship from parts unknown. 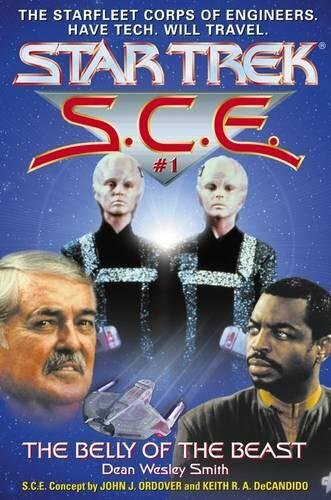 Now that the immediate threat has been neutralized, the S.C.E. has been called in to probe the vanquished hulk in search of both new technology and the secret of its origin. Lieutenant Commander Geordi La Forge has temporarily transferred from the Enterprise to assist Captain David Gold and the crew of the S.C.E. ship, the U.S.S. da Vinci, on this fascinating mission. La Forge works with Gold and his top-of-the-line group of technical specialists to unravel the high-tech mysteries of the supposedly dead alien vessel, only to discover that the real danger has just begun!